As the new lease accounting standard approaches, reviewing each lease to ensure compliance will take you - or your clients - countless hours of work. 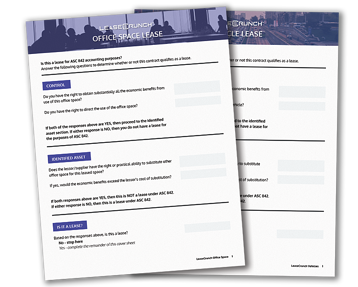 Simplify that process with these cover sheets, which act as an easy-to-follow checklist as you review each lease (or provide to clients to add tremendous value as they navigate this new standard). Download these editable cover sheet templates for office space and vehicle leases now.